Known through the world, burdock is a superb nutritive tonic, a powerful alterative, a rejuvenator and a deep healer. It was written about by Shakespeare, and used by the ancient Anglo- Saxon, Celtic, and Chinese people. Called such names as happy-major, clot-bur, and beggar’s buttons, burdock helps those dealing with skin problems including boils, skin rashes, acne, eczema, psoriasis, and herpes. I apply a fresh root poultice or compress, use the infusion of dried root as a wash or fomentation, or apply the infused oil. A cup of dried root infusion , or 40 - 100 drops of fresh root tincture, taken at least twice a day, hastens resolution of the problem. One of burdock’s constituents, arctigenin, inhibits tumor growth and the formation of cancerous cells in the laboratory. American Indians used it to treat cancer and it is one of the herbs in Essiac, an anticancer remedy. Susun Weed offers the Wise Woman version, Wessiac, a combination of burdock root, yellow dock root, and slippery elm bark. I have given this to several cancer patients with excellent results, including one woman who was suffering severe side effects from chemotherapy. Daily use of 2 - 4 cups of burdock root infusion or 200 drops of fresh root tincture brings slow but steady results. German researchers have found oxyacetylene in burdock, which kill disease - causing bacteria and fungi. To treat fungus infections, candida overgrowth, and ringworm, herbalists recommend a cup of infusion, or 20 - 60 drops of tincture, at least twice daily. As a superior long-term strengthener of the immune system, burdock is a mighty ally for those dealing with HIV, AIDS, cancer, or chronic fatigue. It helps neutralize and eliminate carcinogenic chemicals. Burdock’s profuse mucilage binds metabolic processes, helping them to exit the large intestine quickly. Burdock also nourishes intestinal flora. After a course of antibiotics I take 20 - 40 drops of fresh burdock root tincture twice daily for several weeks. Burdock root may be up to 40 percent insulin  a substance which helps stabilize blood sugar levels. Those dealing with diabetes, hyper - or hypoglycemia find regular use of burdock, in any form, helpful. Rooted way down inside the body of Mother Earth, burdock is rich in nutrients such as iron, magnesium, calcium, chromium, cobalt, silicon, phosphorus, potassium, sodium, zinc, carotenes, protein, and mucilage. Burdock root also contains volatile oils, terpenes, tannins, flavonoids, phytosterols, insulin, sugars, starch, and resins. The fresh root is loaded with vitamin C (little remains in the dried root), essential fatty acids, and vitamin B2. Asians call burdock gobo and eat it as a vegetable. They believe it offers gifts of longevity and sexual vitality. Ayurvedic healers consider burdock root an effective remedy against colds, flu, sore throat, and pneumonia. Chinese herbalists call burdock seeds niu bong zi and use them to remedy the common cold and sore throats. Burdock seeds help heal chronic urinary problems, ease inflammation or irritation of the bladder, and act as a tonic to the kidneys. 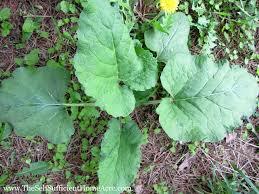 In Appalachis, burdock seeds were used against rheumatism and to nourish the blood. Burdock seeds affect both the sebaceous and soporiferous glands. They do a wonderful job restoring health to hair, skin, and nails. Gather burdock seeds when they turn brown and tincture fresh in alcohol., or infuse in oil. Burdock works slowly but surely. One to three years of daily use is typical. Burdock combines well with dandelion root, the two enhancing each other like a compatible couple. Keep a piece of burdock root in your magical bag to honor your ability to search for and find nourishment for the deepest parts of yourself, and to offer deep healing to others. I dig burdock roots late in the fall, after their first year of growth, or very early the following spring, before the leaves have begun to grow again. Inside the black outside layer is a beautiful, sparkling, white center with a surprisingly sweet taste. I tincture fresh burdock roots in a alcohol or vinegar, or infuse them in oil or honey. I dry them for infusions by hanging them whole or place them, either whole or sliced, on a screen. Fresh burdock roots stored in the root cellar like carrots maintain their integrity perfectly all winter long. Burdock is offered here as a simple extract. It is also an ingredient in our Detox Formula.